The Bob Files – My view of the world from the perspective of a father, husband, UU, consultant, writer, videographer, and long suffering Chicago sports fan. My view of the world from the perspective of a father, husband, UU, consultant, writer, videographer, and long suffering Chicago sports fan. If I point up, I may mean, “Sky.” I may be trying to wipe away the clouds to show you the moon and stars. I may be trying to explain our Place in the Universe. I may be trying to say, “Heaven”. I may be trying to usher you into a paradise place of mythical wonders, Gods Greek and otherwise. How can we be sure? Each of us is trapped, a lump of gray goop inside a fish bowl of bone. We experience the world imperfectly at best. We peer through glasses, listen with hearing aids, touch through bulky clothes and taste and smell despite allergies. We can’t upload our thoughts to the Internet (at least not yet) and communication via Vulcan Mind Meld is a galaxy away. So, how can we be sure? The answer is: we can’t be sure. We speak in metaphor, assigning words to pin down persons, places, and things. We capture actions as verbs and experiences through myriad flavors of descriptors. We fill dictionaries with words and define those words with yet more words. And – despite all of this – a metaphor is not perfect. If I point up and say to you, “Sky,” I may be sharing a vision of crystal blue and golden sun. 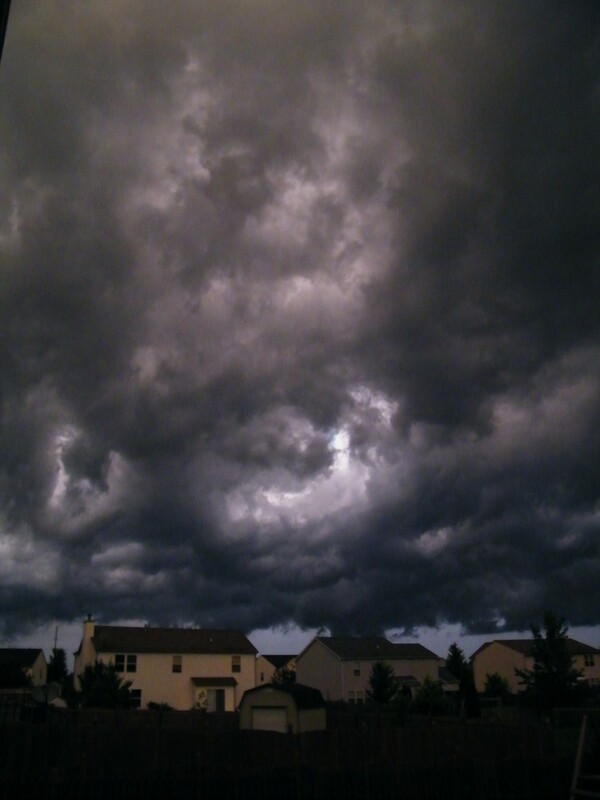 You may hear, “Sky,” and cower before an imminent storm. So we tell each other stories. Each is full of context and connotation. We tell our stories to come together, or to separate ourselves out as human beings, as countrymen, neighbors, members of a religion, fans of a sports team. We tell stories to share love. We tell stories to rally and kill. We tell stores full of empirical facts, to prove Truths are self-evident. We tell stories where we are the heroes, never in doubt, never wrong. We tell stories to feel better about ourselves. We tell stories to make a point. We tell stories because we believe there are some things more “truthful” than Truth. We tell each other a thousand stories a day. Some last only an instant or two, forgotten as soon as they’re done. How was your day? How are you feeling? Let me tell you. Some stories last years. They are told over and over again. Remember that time? I’ll never forget. Let me tell you. Some stories are immobilized in clay tablets, frozen in text. Some stories evolve into tall tales that stride the earth and sea. Some race at the speed of light and fly off into space. Once upon a time. Did you hear the one about? Let me tell you. We speak in stories because they are a perfect viral vector, spreaders that cannot be innoculated against. We speak in stories though stories are not perfect because we are not perfect. We speak in stories because we have evolved to become a species of storytellers. We are each so alone and apart and we wish to share with one another. If I point up, I may mean, “Sky.” Or I may be asking for an invitation to come closer to you. What do you mean? Why are you pointing up? Our two cars are getting long in the tooth. I’d like to say I’ve been thinking about the next car I want to buy. However, I’ve been wondering whether I will get a next car at all. With the price of gas stuck in the stratosphere and the threat of global warming, perhaps it would better to forego a new car and just buy a horse instead. According to the First Time Horse Buyers web page, a horse runs about five thousand dollars. The cheapest new car I could find was a base model Nissan Versa that ran almost three times as much. This is not a true comparison. New horses are actually much more expensive than grown “used horses”. One website puts the break even cost of a foal at almost thirty thousand dollars. Whether mechanical or organic, the initial purchase is just the beginning of the cost of ownership. Edmunds has a “True Cost to Own” calculator for cars. This includes estimated costs for fuel, maintenance, repairs, insurance, taxes and depreciation. I couldn’t find an equivalent equine calculator, but I tried to figure out the costs as close as possible. The average new car lasts about eight years. The average horse has a life expectancy of twenty five years. Results vary; race horses may only live ten years. While I couldn’t find hard data, I assume sports cars don’t last as long as minivans. Cars run on gas, horses run on hay. The average horse eats about half a bale of hay every day, roughly twenty pounds. Horses eat every day, whether or not they are used. The price of horse fuel goes up and down like automobile fuel, actually for the same reason. Tractors are used to harvest hay and tractors run on oil based fuel. The higher the price of oil, the higher the price of hay. Cars require regular maintenance. Horses do too. Expect to change the oil in a car and deworm a horse every few months. The hourly rate for an equine veterinarian is comparable to a mechanic at a Nissan dealer. However, vets make house calls. Nissan doesn’t. Horses require annual vaccinations and periodic checkups. A Versa has a similar maintenance schedule. One advantage of a car is tires. Car tires can last a few years whereas a farrier will be required for horseshoes about every six weeks. Horses need a place to live. Stall size is based on how tall the horse is at the shoulder. This is measured in “hands”. A small pony can be squeezed into a stall eight feet square. I have a two-car garage or a one-Clydesdale garage. If I lived in the city, a horse would need to be boarded somewhere. This runs about five hundred dollars a month. However, a parking spot in Chicago can cost twenty thousand dollars. Advantage: horse. The deal breaker for me is performance. While the Versa is not the fastest car in the world, horse acceleration is unacceptable. A horse goes zero to sixty in… never. I don’t do much off road riding where a horse might have the advantage. It’s illegal to ride a horse on the tollway in Illinois, probably because they charge based on the number of axles. 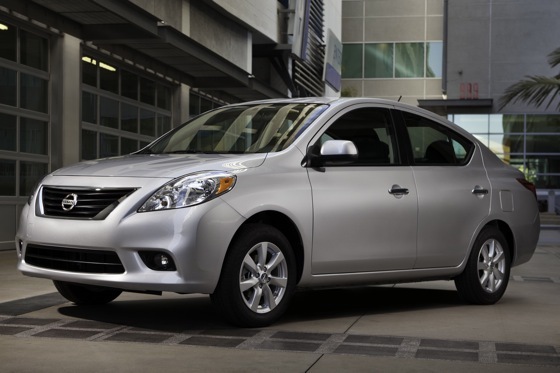 The base engine in a Nissan Versa generates 109 horsepower. 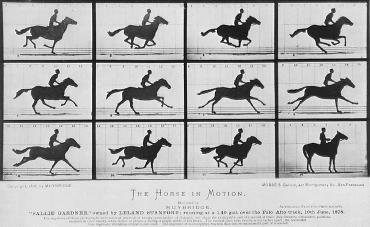 The average horse generates – well – one horsepower. Daniel came home from school the other day with one of his baby teeth in a bloody plastic bag. “That doesn’t make sense,” he said. “Santa Claus and the Tooth Fairy, I mean.” I had an anxious moment, but he continued. I thought a moment. This conversation was getting into some deep philosophical territory. Daniel and I made the trek to Rockford, in search of trees. We have a tree in our yard, but since it isn’t quite as tall as our bushes, it doesn’t count. We stopped at Ack Ack Nursery to see what they had for sale that met all of our arboreal criteria. The tree had to be taller than we were. It had to be big enough to support the weight of the occasional bird. Most importantly, we needed a tree that couldn’t escape. I’m a fan of free range. I like when chickens and cows get to run around before I eat them. I wish we had free range ground squirrels. However, I want my bushes and trees to stay in the yard. Meka and I bought a blackberry bush a few years ago and planted it in the back corner next to the fence. It never grew well there. It was on top of the swale between the yards; water wouldn’t stay there long. The fence kept it in permanent shade, but didn’t seem to stop the wind very much. When the bush wasn’t being blown over or dehydrated, rabbits would come to feed. “We should put some rabbit fencing up,” said Meka on more than one occasion. We never did though. The rabbits ate the berries, the leaves and eventually reduced the entire bush down to a single woody stick poking out of the grass. I thought that was the end of that. A few months later, I noticed a weed growing up next to the cable junction box on the other side of the fence. The ground is muddy and the gap is too narrow for me to mow there. The weed grew taller and taller. One day I noticed it was covered in flowers. Soon after that, it was covered in blackberries. I stood in the corner in the mud, promising this time things would be different. However, the blackberry bush has made no sign of moving back. I think it’s moved on and it was time for us to do the same. I took Daniel with me to the nursery. We picked out a locust tree from the “scratch and dent” aisle. Daniel gave it a hug when I bought it. The tree will be delivered by flat bed truck. There will be no harrowing journey sticking out of the trunk like a rectal thermometer. 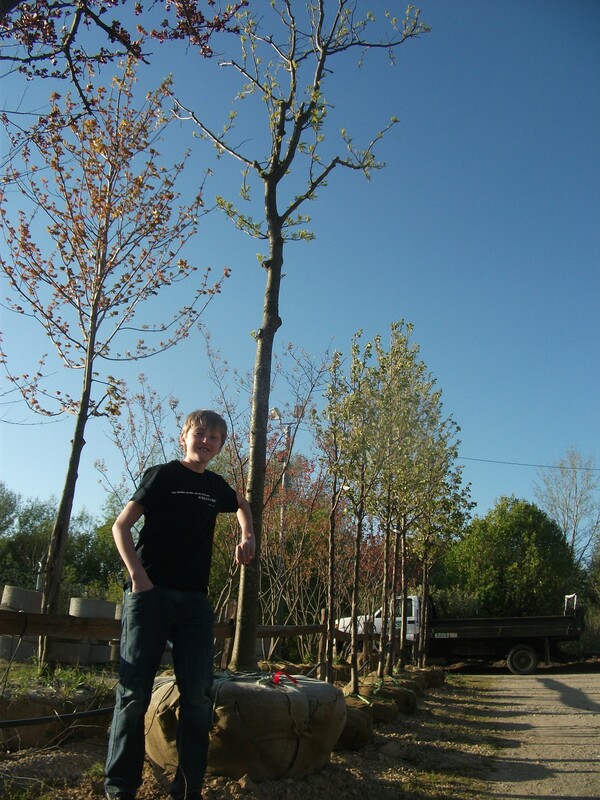 The tree will be planted by professionals and Daniel promised it will be watered faithfully. I think it will like living with us in our yard. But to be on the safe side, we’re getting the fence fixed before the tree shows up. It was a gray, rainy day; truly gothic in nature. I was sitting in my office, listening to the steady patter of the drops mixed with occasional thunder. I started thinking about the people I have known in my life that are now gone from this world. I have a hard time visualizing “heaven” and I don’t think it exists; at least not as the whole clouds and folks walking around with harps vision we’re spoon fed. My thoughts on the afterlife tend to be more observational in nature. I believe that – somehow – the people live on in the memories of those left behind. While that was comforting to me from my perspective – the living perspective – I found I had a lot of questions of what that would mean from the other side. What would such an afterlife seem like to someone who had died? For example, if they only existed in the memories of living people, what were they doing when no one was thinking about them? Were they in limbo? And when people were thinking about them, what did they experience? Did they have independent thought in that short time as their name was spread across the synapses of the brain? Or were they forced to act out a moment in their lives that the memory represented? Was there any outside perception of the world changing after their deaths? Did they catch glimpses of their children as they grew up, grew old then died themselves? And what about famous people? Eventually most of us will be forgotten; maybe that’s for the best. I wondered about someone like Abraham Lincoln. Is he constantly being dragged from the ethereal plane by a world of schoolchildren who read about him in school, is stuck around his likeness in Washington DC and Springfield? Does he have any control or is he forever forced to free the slaves once more, expound on the hallowed ground of Gettysburg, or feel the searing heat of a bullet in the back of his head at his box at Ford’s Theater? If that’s the case, it gives a new definition to “Hell on Earth”. Daniel and I were twenty miles into our mission to visit my sister Amy when it dawned on me I was wearing a white shirt. I don’t know why I bother owning white shirts; they don’t stay white very long. It may be food, it may be drink, but something will end up staining the shirt. And once that happens, I get a small pity sound from Meka and yet another shirt I can wear when I do work around the house. I decided I would make my stand. It was going to be a full day in Chicago, but I promised myself I would end the day with a white (and only white) shirt. “I’m hungry,” said Daniel. It had been almost half an hour since we ate. There was a Burger King at the next exit. We stopped and went inside. There would be no drive thru eating while wearing a white shirt. I ordered a Whopper with nothing on it. Daniel got a burger and fries. “Fanta,” he replied. I looked at the drink station. They had Fanta, but only in grape. I used to work in fast food, so I know how the drink stations work. I pressed the Fanta button and stepped to the side so the first few purple drops of soda hit my arm instead of my shirt. I could wash my arm. I dropped the drinks off at the table and stopped Daniel from banging on the ketchup packets with his fists before disaster ensued. It took us an hour and a half to get to Amy’s place. We met her and took the bus to the lake. We were packed in like – well – like people on a bus. Sardines have it easy. I was bumped and bruised and elbowed on occasion, but I managed to avoid any spills and any stroller children with candy. The beach was nice. We walked along the retaining walls across from Navy Pier. Occasionally a wave would rush up and splash us with spray. I thanked my lucky stars we weren’t being splashed by the Chicago River. Daniel invented some games with a little rubber ball he found in the park. I forget what they were called, but they all seemed to require fishing said ball out from under bushes and flower boxes. Still, my shirt stayed clean through the afternoon. Food in Chicago is expensive, but Subway had a deal on a couple of footlongs for just five dollars. We ordered meatball marinara sandwiches. I pulled one out of the bag and unwrapped it before remembering what color shirt I was wearing. Daniel finished long before I did, even Amy sat and watched as I delicately nibbled at my sandwich to avoid any red spots on my shirt. That had to be a first. Dessert was chocolate chip cookies, fresh from the oven with the chocolate still gooey. Again, not a single spot and I washed my hands like a surgeon afterwards to avoid any secondary staining. All in all it was a good day. Daniel and I had fun with Amy. We had fun wandering around the city. We stopped back at her apartment before heading home and I inspected my shirt in the bathroom mirror. Nothing. The shirt was still white except for a dark mosquito on my shoulder in mid-bite. I slapped it and came away with a long streak of blood on my shirt. 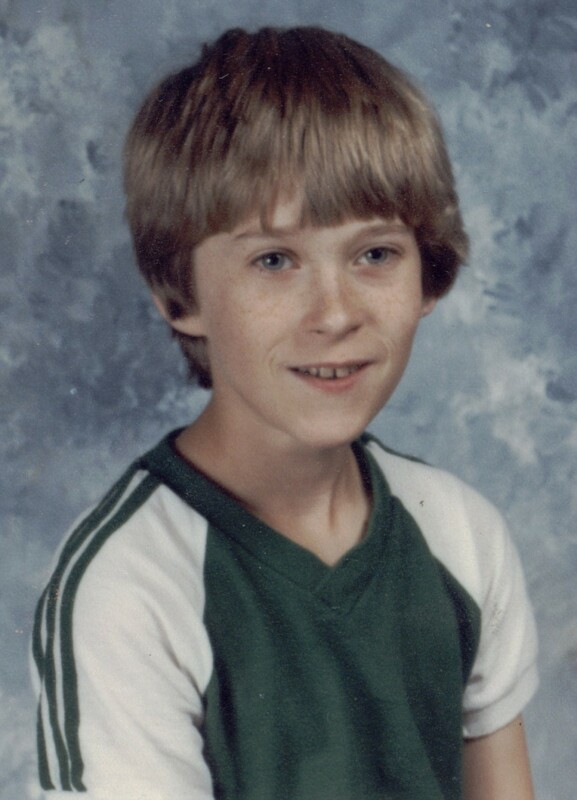 I was in fourth grade in the spring of 1980. Mount St. Helens was the big story. My class followed the volcanic rumblings in the pages of the Weekly Reader, but – frankly – that wasn’t enough. Things were happening very fast. 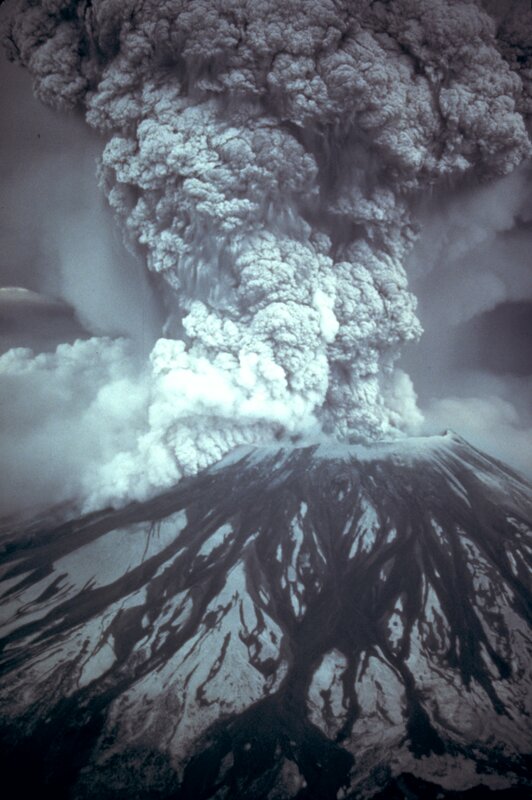 My teacher – Miss Lewis – said we should all watch the news on television so we could discuss Mount St. Helens in class. I sat with my dad in the family room and watched the reports from ABC News. Two things stuck in my brain. I remember the scientists studying the mountain weren’t dressed like scientists. They didn’t wear white coats, just T-shirts and shorts and tennis shoes. As the area around Mount St. Helens was evacuated, some people refused to leave. I remember one old guy who didn’t go was named Harry Truman (no, not that Harry Truman; he was a different one). The volcano exploded May 18th and it was a lot more serious than anyone had predicted. I remember the film report on ABC News that night. There was nothing to see; the film was almost pitch black. All I could hear was the reporter whispering “I’m dead” over and over again. The local weatherman said weather satellites could see the eruption from space. The next issue of the Weekly Reader showed the cloud of ash rising miles into the sky. I remember one of the scientists was killed along with Harry Truman. I never met either of them, but I felt like I knew them after seeing them on television so much. We had a new student in my fifth grade class when we went back in the fall. Her name was Wendy. She was from Oregon. We had “Show and Tell” the first week of school. Wendy passed around a glass peanut butter jar. It was full of something dark and muddy, but it wasn’t dirt. It was volcanic ash from Mount St. Helens. I was very impressed; it was like having an autograph from someone famous. Rockford has not one, but two all you can eat buffet restaurants and they are only about a block apart. The competition is fierce. Even in Belvidere, we get coupons from one restaurant or the other about every other week. Despite the siren song of savings, I wasn’t really tempted to eat at an all you can eat buffet until Daniel started wearing a shoe size larger than mine. I thought it might be a good idea to make a test run prior to his becoming a teenager. It might allow us to stay financially solvent. It was already dark when we pulled in the parking lot. The car was bathed in red from the never ending stream of menu items on the restaurant sign. It was a full house. Everyone in line had the coupons too. However, things moved quickly and Daniel and I found a seat near the door. “Here’s the way it works,” I said. “You can take whatever food you want, but you have to eat it. I don’t want it to go to waste.” Daniel nodded. He took one of the big white plates and began scooping out mashed potatoes. “You might want to look around a bit,” I said. “I like mashed potatoes,” he said. “I know, but you might like something else better,” I said. “You might want to check out the other stations before you commit.” Daniel put the spoon back in the tray reluctantly and walked around the other tables. He stopped at the dessert station, but I didn’t even give him time to grin. “But I like this better than mashed potatoes,” he said to no avail. Mean Dad still shook his head no and made him turn back to the real food. Besides the mashed potatoes, Daniel came back to the table with a slice of ham, what looked like sweet and sour chicken and a small hot dog. He rolled the wiener around in the orange sauce and pronounced it delicious. “I can make my own recipe with this,” he said. “I’ll call it the hot, sweet and sour dog!” I’m not sure what “old country” the buffet originated from, so I refrained from dismissing the idea completely out of hand. Round two was salad: four pieces of iceberg lettuce and a tomato slice covered in enough bacon bits to reconstitute a pig. And more mashed potatoes. I have to admit that mixing the mashed potatoes with bacon bits looked pretty good to me. I went back up and got a scoop myself. “Daniel, I’m sorry I ever doubted you,” I said. “You really don’t like anything more than mashed potatoes, do you?” Daniel’s third plate had a little bit of corn, a little bit of green beans, a lot of mashed potatoes and a taco. “I’ve never had tacos with mashed potatoes before,” he said. I’m forty two years old. I’ve never had mashed potatoes with a taco before either. Daniel reported the taco shell worked quite well as a scoop and the drippings from the taco meat made a “Mexican Gravy” that was incomparable. “You should try it,” he said, getting up for more. I remained where I was, listening to the menacing creak of my belt struggling to hold in the two plates of cafeteria food I had consumed. The buffet closes at eight thirty and it was almost nine. Daniel’s fourth and final plate was color coordinated. “I got all white food,” he explained. “It matches the plate, see?” He had some grilled fish, cauliflower and a biscuit. “No mashed potatoes?” I asked. “They ran out,” Daniel replied. ESPN covers the hot dog eating contest on Coney Island every Fourth of July. If they wanted to see some real competition, they should really follow a bunch of teenagers as they make their way through the buffet like locusts. It was an amazing sight. We closed down the restaurant and headed home with one final stop… for dessert. It was “Movie Night” the other night. Movie Night doesn’t fall on a specific date. It just happens to be an evening where we’ve done all the work we need to do and eaten dinner at a decent hour. There’s enough time left before bedtime to view some of the thousands of gigabytes we’ve recorded on the DVR. It was my turn to pick something to watch. Daniel looked a bit wary. “We’re going to watch some old movie, aren’t we?” he said. I nodded. So much of our culture depends on references to old music and movies and television shows. I felt it was my parental duty to educate my child so he knew what his parents’ snarky comments meant. Not to mention, we don’t get channels with newer movies; they cost too much. “I thought we would watch The Wizard of Oz,” I said. “Aren’t you a kid?” I asked. He didn’t have a good counter to that. I’m worried my window of opportunity is closing with Daniel. He’s growing up. I think he will be able to appreciate older movies, maybe understand them from an intellectual standpoint and how amazing they were back in their day, but he won’t be able to appreciate them at a visceral level any more. They’ll be good movies, but not his movies. I hoped for the best. We popped some kettle corn and took a couple of boxes of Dots down from the corner cabinet. We made ourselves comfy on the family room couch, sharing the green throw on our feet. We turned out the lights and started The Wizard of Oz. Daniel got right into it. He didn’t beg me to use the commercial skip when Dorothy started to sing. There was concern on his face when she was trapped outside during the tornado. Daniel brushed it off when I mentioned it. 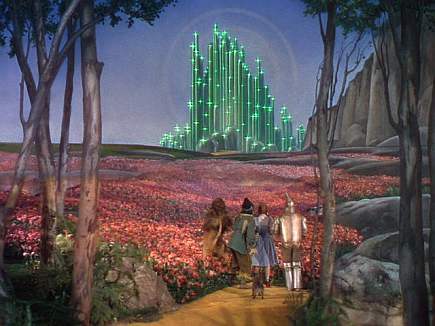 I pointed out how the film went to color when Dorothy arrived in Oz. It turned out Daniel hadn’t noticed. He just thought it was “the color of Kansas” before that. He liked the Scarecrow and the Tin Man right away. He thought the Lion was a jerk at first, but he grew on Daniel as the movie went on. I got the first question when the group tried to cross the poppy fields. “Do poppies make you pass out like that?” he asked. “I think it’s a metaphor,” I said. I have to admit, I still think the flying monkeys are seriously creepy. I must have looked distressed near the end of the movie because Daniel patted my arm. “Don’t worry, Dad, Dorothy’s not going to die,” he said. “All she has to do is keep turning over the hourglass and she’ll be fine.” I’ve probably seen The Wizard of Oz ten times since I was a kid and I never thought of that. It made me feel better about the whole thing. Daniel felt the ending was kind of weak. He didn’t like the “… and it was just a dream” malarkey. I explained they needed the movie to have a happy ending. Daniel and I were sitting in a booth at the local Grill and Chill, finishing up the “grill” portion of our meals. We were surrounded by vintage pictures of Dairy Queen days gone by. Daniel eyed one hanging over our booth from the 1960’s. It featured a band called The Zonks. “I wonder why all old pictures are in black and white,” he said. I finished up my French fries. “That was all they knew how to do a long time ago,” I said. “They invented black and white film first and didn’t invent color film until much later.” Daniel swallowed the last of his double cheeseburger, but seemed to have a hard time swallowing my explanation. “What do you mean?” I asked. Daniel paused for dramatic effect… and to test his Blizzard by turning it upside-down for a moment. “Shades,” I corrected. I couldn’t help myself. “Sorry,” I said. “Black and white pictures have shades of gray, no colors.” Daniel gave me a long look. I almost choked on my malt. “I read it somewhere,” I said. “I think I read that too,” said Daniel. I nodded. We’re both fans of Calvin and Hobbes. After a moment he shook his head. “That’s not it,” he said. “They still took pictures in black and white after color film was invented. Why would they do that?” I shrugged and sipped the last of my malt. “Money,” I said. “Color film cost more than black and white film when it first came out.” Daniel almost leapt over the table. “A-ha!” he exclaimed. “That’s why they did it. Money. They wanted to save color film for later so they could make more money.” Daniel sat back with the smug satisfaction of someone with all the bases covered. I had to admit it made an odd sort of sense; it didn’t even occur to me ask who “they” were. “Follow the money,” I said to myself. “Where did you hear that?” Daniel asked. “I think I read that too,” he answered. I was surprised. I didn’t think Woodward and Bernstein were required reading in the sixth grade. My son Daniel turned twelve last week. We had my twelve-year-old self over for some cake. He was glad to come. February, 1982, was a cold month, even as February goes in Chicagoland. He was half a head shorter than Daniel and his gap-toothed smile didn’t have as big of a gap as Daniel’s did. Otherwise, they looked a lot alike. They were both skinny with long straight hair. They looked like a pair of blond Q-Tips, dressed in similar T-shirts, jeans and sneakers. Daniel was excited. “Welcome to the future!” he exclaimed. Twelve-year-old Bob looked around the living room. It didn’t look much different than the one he’d left at home in 1982 except for the colors (or lack thereof). Daniel ushered him up the stairs to his room. “I like your television. It’s flat,” said Bob. Daniel laughed. “That’s the opposite of me,” replied Bob. “I have a TV in my room, but the computer is in the den.” Daniel sat down and turned it on. They watched the status line cycle under the Windows XP logo. “It’s kind of slow,” said Bob after a few moments. “My TRS-80 turns on immediately.” Suddenly, the screen turned a sickly shade of blue with strings of command code. Daniel sighed and turned it off. Daniel nodded. “That’s like our CD’s,” he said. He showed twelve-year-old Bob a silvery disc. Bob was impressed it was played with a laser. Meka called them to come downstairs. We were expecting twelve-year-old Meka, but apparently it was too hard for her to get from Michigan in 1987. It wasn’t like she could ride her bike. Twelve-year-old Bob sat down with Daniel at the kitchen table, enormous slabs of cake on their plates. They talked about rockets they had launched and movies they had made. “We used a web cam to make my Penguinzilla movie last year,” said Daniel. They ate cake until their mouths were coated in blue and yellow from the thick buttercream frosting. After some pop (orange Jarritos and Coca Cola from a glass bottle), they sat together on the couch in the family room. Daniel showed off his new XBOX 360. Twelve-year-old Bob complained there were too many buttons on the controller. “You know how many buttons David’s Atari has?” he asked. “One. That’s easy to remember.” I could commiserate. Twelve-year-old Bob pressed “B” instead of “A” and watched in dismay as his avatar on the screen stumbled blithely into some fatal situation. Daniel played a bit more and then shut the game off. The sun was setting. It was getting time to go. “How’d you like the future?” asked Daniel. “Do you really believe that?” asked Bob. Daniel shook his head. Daniel opened the front door and held it open for him. I picked Daniel up Friday afternoon from cross country practice. He plopped down in the passenger seat, bag in his lap, a smile threatening to take over his face. “What’s so funny?” I asked. Daniel grinned and shrugged. I asked if he had a good day at school. Another grin and shrug. I asked if he wanted to stop at the corner gas station, get a bottle of orange Fanta before heading home. Grin. Shrug. Finally I asked if he had any homework. This was apparently the question he had been waiting for. One of his Language Arts teachers sent home a blue page addressed to parents. “You know your children better than I do. Please tell me in a million words or less about their passions and their strengths. How do you think their story will be written in the future?” Wow, I thought to myself, it’s been a long time since I had to write a theme for school. “You really should sit down at the kitchen table and do this right away,” said Daniel. 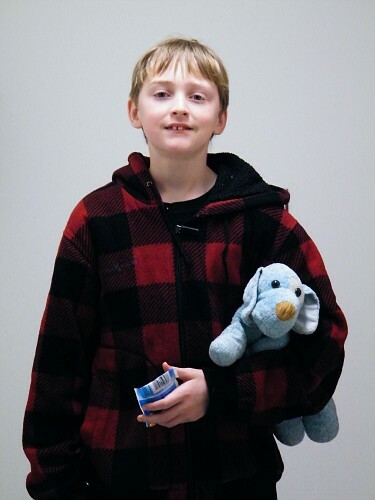 “Otherwise you’ll be working on it at 3:00 in the morning before school on Monday.” I took some comfort that – despite outward appearances – Daniel had actually been listening to me all these years about homework. I sat down and thought for a few minutes while Daniel set up a game on the Wii. “You don’t have to mention Oscer,” said Daniel suddenly from the family room. Oscer is a stuffed blue dog. He’s been Daniel’s sidekick since Kindergarten. They used to go everywhere together. Lately I’ve noticed Oscer is more of a recluse; he only plays with Daniel when they are alone together. “Isn’t he your prized possession?” I asked innocently. “Aren’t you losing your game?” I asked. Police had Daniel’s car surrounded. He reset something and was off to the races again. I put pen to paper. There was a screech of tires from the family room. “Never mind,” I said. “I’ll just get the dictionary. I make you look up words before asking for help. I should do the same.” Daniel was clearly focused on his video game, not at all watching me from the corner of his eye as I looked up various words – ‘diaper’ and ‘naked’ – and jotted them down on a sheet of notebook paper. I was leafing through the pages, looking up ‘booger’, when Daniel finally snapped. “What on Earth are you writing about me? !” he demanded. I handed him my paper. Daniel is a good kid. He has many strengths. However, he falls for Dad’s practical jokes all the time. Daniel tried his best to scowl, but he kept smiling instead. Finally he laughed. It was the last laugh, by the way, as I didn’t finish the actual theme until 3:00 Monday morning before school.